How Will You Work Out When CrossFit Is No Longer Hip? : Shots - Health News Fitness programs typically don't have much staying power. People are already saying adios to Zumba and Pilates. The cheapest and simplest routines are more likely to be keepers. Think down dog. 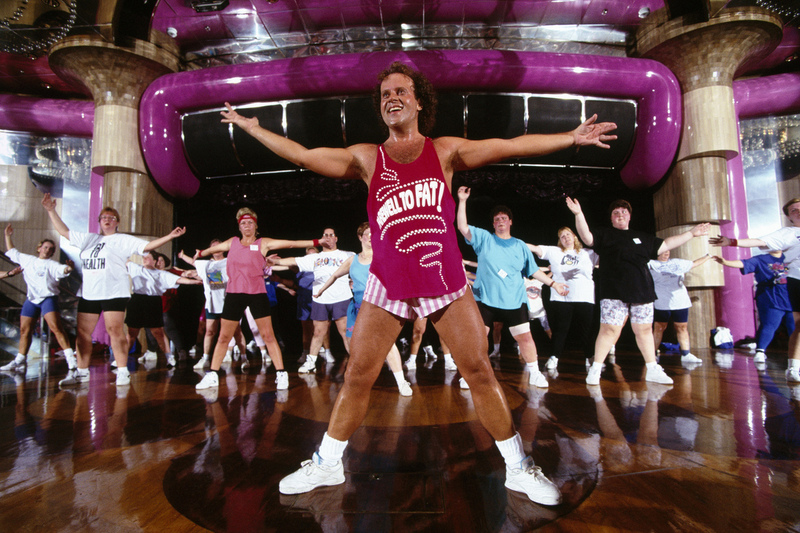 Richard Simmons was the hottest thing in exercise programs back in 1996. The garb may have changed, but fads are still fickle. I have, on more than one occasion, unwittingly tuned into a midnight infomercial only to see a beefy male instructor flex as he pulls two high-resistance bungee ropes down into a squat on his gleaming silver Bowflex. Just five easy payments, the infomercial promises. And yet, does anyone actually use Bowflex anymore, outside of researchers of blog posts? It's gone the way of Richard Simmons, Tae Bo, the Slendertone, P90X and, soon, inevitably, CrossFit. These trendy workouts marketed by gyms and entrepreneurial athletic trainers come and go quickly, says Walter Thompson, author of the American College of Sports Medicine's Worldwide Survey of Fitness Trends for 2015. For the past nine years, this survey has listed the top 20 fitness trends worldwide. This year, the top trends include body-weight training, high-intensity interval training and personal training with certified professionals. Zumba, which was No. 9 in 2012 and dropped to 13 in 2013, no longer ranks in the top 20. Pilates, indoor cycling, stability balls and balance training have also fallen off the list, while new marketing for body-weight training programs at gyms have earned the trend a spot. But where do new forms of workout come from? "Sometimes it is the creation of a 'new tool,' other times it's the introduction of a 'new use' for an old tool," says Neal Pire, a veteran of the fitness industry who works at HNH Fitness in Oradell, N.J. For example, indoor biking or "spinning" required a new tool. However, step aerobics classes that were popular in the early 1990s were used in research and academics for physical conditioning long before finding a home in the gym. Hot new fitness trends are often a crucial blend of serendipity and marketing. Take Zumba, Pire tell Shots in an email. Its creator, Beto Perez, was a group exercise instructor in Cali, Colombia, who showed up to teach an aerobics class one day without his music tapes. He improvised with some salsa and merengue he happened to have with him, and faster than you can say "Latin dance party," a new fitness phenomenon was born. But Zumba didn't stick around for long, says Thompson. He predicts that high-intensity interval training like CrossFit will soon follow in its footsteps. "High-intensity interval training is the result of a lot of these infomercials," says Thompson. "I think that in five years, we're not going to be talking about [it]." Part of the reason, he suggests, is because there's a high probability of injuring yourself when doing aggressive exercises. High-intensity interval workouts like P90X are like driving a very fast car, he says. "You can go 90 miles per hour or you can go the speed limit, and the greater chance of having an accident is at 90 miles per hour." Fitness trends are also influenced by the economy. When the economy began shrinking in 2007-2008, the fitness industry also collapsed back to the basics, hence the growth of boot camp classes, which require few props. Purchases of pricy gym equipment like stationary bikes declined. "Indoor cycling is very expensive to maintain," says Thompson. "If one of those bikes break, if you can't fix it yourself ... you're looking at $100 to $200 to repair something as simple as a pedal." Now, with the economy on the rebound, many of these programs are beginning to come back, he says. Federal health policies may also affect what trends come and go. The Affordable Care Act reimburses physicians to help counsel patients on their fitness habits. This may help explain why training with "educated, certified and experienced fitness professionals" ranks third on the fitness trends survey, and "personal training" comes in fifth, says NiCole Keith, an associate professor of kinesiology at the Indiana University Center for Aging Research. However, there is one trend that has shown surprising staying power through the years. "The yoga folks surprise me every year," says Thompson. He thought yoga would've gone the way of Pilates, quickly dropping off the top 20 list. But people who promote yoga, he says, have figured out ways to get new people to try it. Whether it's Bikram yoga or power yoga, "they reinvent themselves so it continues to be popular." "Fitness programs for older adults," Thompson says. Gyms may need to start supporting nonmillennials by switching their music choices (maybe more Bach than Beyonce) and having the tools for people to practice their golf swing or other more leisurely sports. And, of course, wearables like Fitbit or Jawbone are popular, says Carl Helmle, vice president of training at David Barton Gym, a chain in New York and seven other cities. It's now a question of "how do we get this wearable tech integrated into the services we offer?" he says. Their gym, like others, is investing in ways to help members track their data, whether it's steps, heart rate or even molecular changes in the blood. But if you're worried about missing a trend like pole dancing or stability balls, don't be. Because while it's not a fun answer, the best workouts have stayed the same for a long time, simply because they work. Says Helmle: It's all about the "basic movement patterns, which incorporate a little bit of strength training and cardio." That means walking, running, biking, swimming, lifting weights — activities without gimmicks. While they might be common and too pedestrian for some, they're cheap, easy and manageable on your own. Let's see the new trends top that.